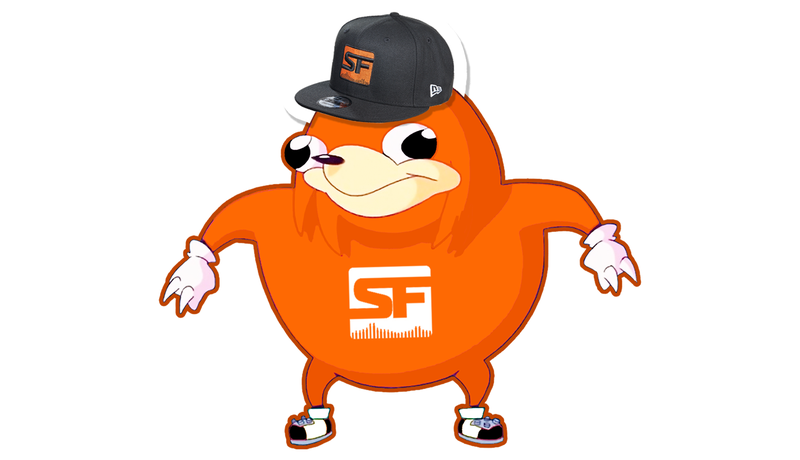 From a SF Shock tweet that uses the Ugandan Knuckles meme. On the opening night of Overwatch League, a Dallas Fuel fan at the Blizzard Arena hoisted a sign with the alt-right meme frog Pepe on it, and had it confiscated by event staff before the night was over. But that was only the first meme with racist associations to worm its way adjacent to Blizzard’s big mainstream esports push. Much like Pepe the Frog, a character created by cartoonist Matt Furie, Ugandan Knuckles does not look like a racist dog whistle at first glance, and the fans and pros who hop on board with it may not even know its association with online bigotry. Ugandan Knuckles is actually a mash-up of two unrelated memes. A YouTuber who goes by Gregzilla made a video review of a Sonic game featuring a squat, cartoonish rendering of the character Knuckles. His version of the character became a mouthpiece for funny songs and other memes, such as a popular one-liner from an indie Ugandan action-comedy movie, Who Killed Captain Alex. In the context of the movie, the one-liner “He knows the way of using a gun!” is absolutely intended to be funny—it’s one voiceover line in a series of fourth-wall breaks that mock action movie tropes. It’s also something you could shout at opponents in Player Unknown’s Battlegrounds, a multiplayer shooter set in a wasteland. Fans of the PUBG streamer Forsen brought the meme to new heights by mobbing him in-game during his Twitch broadcasts and quoting the movie at him, while also playing as black characters. But on the internet, which was a mistake, these reenactments go beyond just quoting a comedy movie. The movie’s original quote has now been bastardized into the phrase “do you know the way,” and it’s often followed by racist jokes that have nothing to do with Captain Alex, like exaggerated imitations of the clicking from Khoisan and Bantu languages, or cracks about the Ebola virus outbreak in West Africa. Meanwhile, Gregzilla’s cutesy drawing of Knuckles, so often used as a mouthpiece for other popular memes, has become the primary mouthpiece for this exaggerated Ugandan caricature. By now, the two memes have fused into one. Ugandan Knuckles has gained newfound popularity in the community for the game VR Chat, and since then, references to him have popped up in many other gaming communities online, including Overwatch. Ugandan Knuckles’ repeated appearances in and around Overwatch League have prompted confusion from viewers who rightly point out that the meme has become a racist caricature. As of week two of OWL, Ugandan Knuckles signs were still making occasional appearances in the crowd on match broadcasts. Blizzard did not comment on whether they would confiscate them in the future, but their “arena” was originally for The Tonight Show—it seats less than 500 people, meaning it would be pretty easy to spot a sign immediately.